ERROR: COM call "m_pVssObject->BackupComplete(&pAsync)" failed. 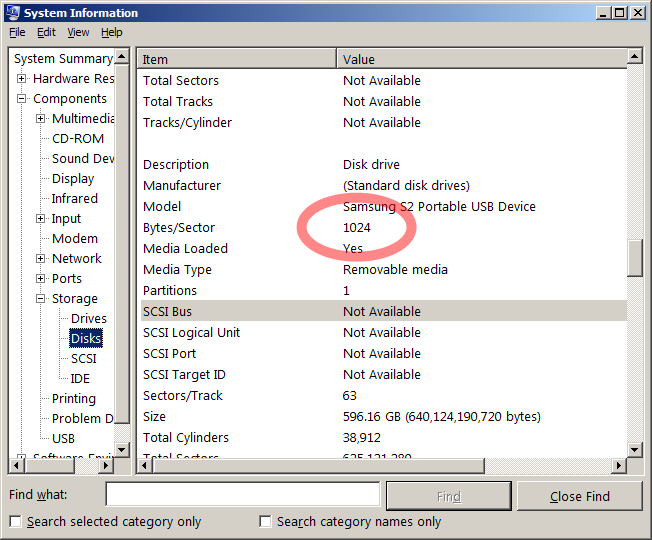 The windows snapshot component VSS will fail if a disk with a non standard sector size is attached to your system. This error will occur regardless of whether the disk is a backup source or target. This can be an internal disk or one connected by USB or eSata. The issue is actually caused by USB enclosures that modify the disk drive geometry in the USB to SATA bridge. Windows XP,Vista, 7, Server 2003, 2008, 2008 R2. Run 'System Information' ('All Programs' > 'Accessories' > 'System Tools' > 'System Information'). Expand the Components->Storage->Disks node, and scroll down the list of disks, looking for any that have a Bytes/Sector value not equal to 512. Unfortunately, until Microsoft fix this issue, the only option is to remove this disk from your system. Read this Article for general information regarding Microsoft support for non-standard sector sizes. Whilst Microsoft's official position remains that disks with non-standard sector sizes are not supported, there is a possible workaround for Windows Server Operating Systems using a command line tool called VSSAdmin. These operating systems support disks that report a native sector size greater that 512 bytes.